Make 10 May strike real. Make it big! Fighting the Tories: what next? 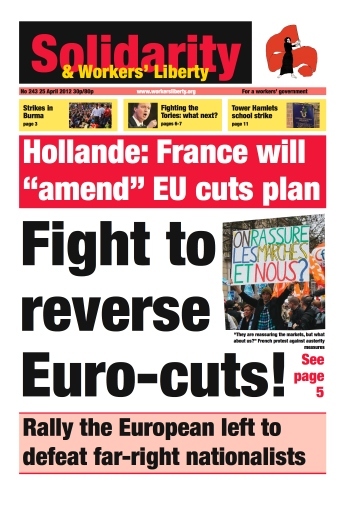 Hollande set to win French Presidency: fight to reverse Euro-cuts! Billionaires out of media! Tories out of office! Missed chances in May 3 polls? "Much more than closing the odd ward"
Citizen Protection minister Michalis Chrisochoidis, a member of Pasok (rough equivalent of the Labour Party), is leading an anti-refugee drive in the run-up to Greece’s parliamentary election on 6 May. The last act of the Papademos coalition government was to pass legislation for the construction of 31 concentration camps (in former military facilities) for illegal immigrants, identified in the election campaign as threat number 1. Tube Lines workers, who do maintenance on London Underground lines, are striking on 24-27 April. Their demand for pensions equality has a more “offensive” character than other disputes on the Tube (or indeed in other industries or sectors). Trade unions organising at the BBC have announced they will ballot members for strike action to win a pay increase in line with inflation. A joint statement from the National Union of Journalists, Unite and the Broadcasting, Entertainment, Cinematograph and Theatre Union (BECTU) on Thursday 19 April described BBC bosses’ current pay offer — a 1% increase — as “derisory”. 550 workers could lose their jobs as British Gas plans to close its Southampton centre. The company says it needs to “reduce costs” and than an increase in online custom means fewer call-centre workers are needed. The precise extent of the public sector pensions strike on 10 May remains unclear, as some unions are pushing the day as a mere “day of action”, while others emphasise walkouts and pickets. A conference of oil tanker driver trade union reps has overwhelmingly voted to reject the deal offered by fuel haulage bosses in an attempt to avert a potential strike over safety and minimum standards. Teachers and support staff at Central Foundation Girls School in East London will strike on Wednesday 25 April as part of a battle to resist redundancies and pay cuts. Liam McNulty concludes his article on the Trotskyists in the Spanish revolution of 1936/7. The first part appeared in Solidarity 242. In December 1936 the POUM was ejected from the Catalan Generalitat (provincial government) on the orders of the Soviet consul in Barcelona, Vladimir Antonov-Ovseyenko (the man who led the Bolsheviks’ assault on the Winter Palace in 1917). In 1992 Italy was engulfed by the corruption scandal “Tangentopoli” (bribesville). That, Italy’s most serious post-war political crisis, saw the end of the First Republic and all its major political parties. Leading the mass protests outside and inside parliament was the Lega Nord, led by the populist figure of Umberto Bossi. He encapsulated the radical mood and spirit of his party’s programme by waving a noose and bellowing “Roma ladrona” at the ranks of cowering politicians who were only too aware that their game was up.